Kat and Karl : ¿Dónde está la biblioteca? So, yea, this Thursday I will be attending an event in Little Rock to benefit Reach Out and Read Arkansas. This organization provides resources to families to encourage reading in the home. Nate has received a board book at each of his pediatric visits so I think our clinic benefits from this program. I digress. I think my favorite CHILDHOOD book was, uh, huh. I clearly remember thumbing through a well-loved Aesop's Fable book at a very young age. And I wore out my copy of Baby Island which is a ridiculous book about a sinking ship and two teenage girls marooned with four infants. And then I tore through The Hardy Boys and Nancy Drew and then, you know, silly 90s book like The Babysitters Club and Sweet Valley High and, uh, V.C. Andrews. I've probably read a solid 40 or so books this year and I've been on a huge biography kick. (why, no my laundry is never done, thanks for asking.) Most are from the library, but I do purchase occasionally or read them on my ereader. And, why, yes, yes i do arrange them by color on my bookshelf. thanks for noticing. I am trying really hard to instill a love of books in my babe. We currently attend several library story times (our favorite is the Main Library on Mondays - they have a great program and FREE!) Nate's first birthday party was a bookworm themed party (complete with wormy dirtcake) and he already has quite the library. it makes me happy when he brings a book over and climbs in my lap. YAY!!! I love reading too, and find it ridiculously wonderful that you wish to instill a love of reading to Nate. Good job!!! Fave childhood book?? Probably Anne of Green Gables. It was the first book I read all on my own. And when I was really little, I remember Mummy reading all of the Little House on the Prairie books to us... and Black Beauty... and Treasure Island... all the old classics, really. Every evening on Mummy's bed. Best tradition ever. man. choosing a favorite childhood book? impossible. there are a few that really stuck with me - but i don't think i could pick a favorite! i would do the library summer reading programs as a child and fall asleep with a book on my chest pretty much every night. i should start going to the library again! I like the idea of a reading post. I was always reading as a kid. My favorite books with pictures were Alexander and the Terrible Horrible No Good Very Bad Day and The King Who Rained. That one was all about words that have two meanings and I thought it was brilliant. Oh, I also loved the Frances books, especially Birthday for Frances. Frances is a badger and is very funny. loved books when i was a kid, and love them now. i'd love to tell you that i was super smart and accomplished and read important, timeless literature as a child, but the truth is, my very favorite book when i was little (and maybe still...) was "ferdinand the bull." he didn't want to fight, even though he was enormous. he just wanted to smell the daisies. my mama read it to me all the time, and i was always surprised at the end of it. like i said, not necessarily the brightest kid in the bunch. Sweet Valley all the way!! Also, I remember once a Goosebumps book scared me (and still terrifies me to this day..pet ants busting loose crawling in your mouth when you scream!?). They shoudln't give that to 8 year olds. Umm..also, who could forget The Giving Tree and Where the Sidewalk Ends?! Oh Shel. I want to go read now! The Velveteen Rabbit, oh how I love it so. Also I have the best memories of my mom reading the entore Chronicles of Narnia to me. One of my very favorite places is the bookstore. I love the smell, the excitement, just knowing that there are thousands of books just waiting for me to curl up on the couch or in bed and devour. Will I ever have time to do that again? I wish I could say I read a lot as a kid but wasn't really brought up that way but kind of picked it up on my own. There is one book I had at my grandma's that I read a lot and still have it. I can't remember the name. Nash loves books and loves to read and I plan on bringing him up loving to read. I've turned into THAT person that never comments. I hate not commenting. But I love books too. And, like you, I hope to encourage a passion for reading and book loving in my daughter. Oh my! I miss reading. I need to start curling up with a book after Lucia goes down. Cannot wait to hear about this Little Rock Reads thing-y ... tomorrow! 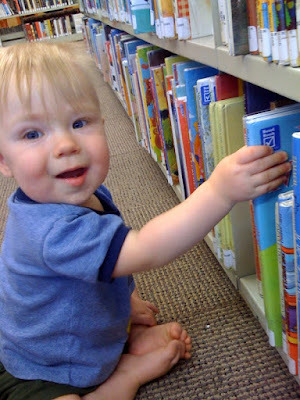 You are such a good mum for taking little man to the la biblioteca so often. I love it. Okay and finally... to answer your question... Hands down, favorite childhood book(s): "Little House on the Prarie". My dad read every last one to us. He would sit at the top of the stairs on our landing, where all three of our rooms connected, and read every night. first memory of my first book that i read on my own: Sweet Valley High. My mom saved a slew of our childhood kiddie books, I love looking at them on the shelf when I am in her nursery at home. I read them to L-belle.